A column of fire lighting the sky. Oil spilling into a nearby river. If the horrifying images of this weekend's West Virginia oil train fire and spill seem familiar; they should. We saw the same type of disaster in the state last summer too, when a train derailed last April in Lynchburg, Virginia, dumping 29,000 gallons of crude oil into the James River. And like last year, Big Oil's allies will try to turn this mess into an argument for their pet project: the Keystone XL tar sands pipeline. Their argument is that we can build the pipeline OR we will have more fiery infernos along the nation's rail lines. It's a scare tactic. And it's wrong. Building Keystone XL will do little or nothing to reduce the risk of fiery disasters like we have seen in West Virginia (and Minnesota and North Dakota). That is because those oil trains are carrying oil from the Bakken formation in the Dakotas. Shale oil from North Dakota's Bakken formation - like oil fracked from other shale deposits in places like Colorado, Wyoming, Texas and elsewhere - contains particularly high levels of flammable gases and it has shown a higher risk of igniting in crashes. As railroads ferry more and more of this kind of crude, the risks of transporting potentially explosive cargo touches more and more of our communities. North Dakota's producers aren't shipping their product by rail because they're not able to build pipelines. In fact, Bakken producers turned down two major pipeline proposals by Oneok and Koch Industries that would have shipped nearly half a million barrels a day to the Midwest and Gulf Coast. The simple fact is that for a variety of reasons, North Dakota's producers prefer shipping their crude by rail to the East and West Coasts than to the Gulf Coast by pipeline. The proposed Keystone XL pipeline is not going to take that oil off the rails. It is designed to move thick, carbon-intensive tar sands from Alberta to the Gulf Coast. Very little tar sands is moving by rail. Because shipping heavy thick bitumen by rail requires specialized infrastructure and tar sands is already so expensive to produce, the increased cost of putting tar sands on trains make it unlikely we will see that change any time soon. The first companies to try to make tar sands by rail work are either on or past the brink of bankruptcy. 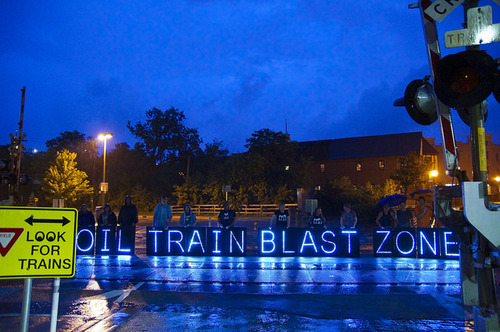 If we want to reduce the risks from oil trains, let's fix the trains and toughen safety standards. Many of the same industry groups pushing to build Keystone XL are fighting the common sense safeguards that would protect our communities from crude by rail accidents. Disingenuous efforts to tie rail safety to tar sands pipeline construction is a bait and switch that hide the industry's desire for more pipelines AND unregulated rail access. To prevent crude by rail accidents like the one in West Virginia, we are going to have to get serious about addressing the risks emanating from the crude by rail boom.